Step 1 Scoop Sabra Hummus dip into a large shallow bowl like this one, for example. Spread using the back of a spoon or a rubber spatula. Drizzle generously with quality extra virgin olive oil (it’s a good thing if the olive oil “pools” over some parts of the hummus dip. Step 2 Next, arrange the fresh herbs and greens (mint, basil and baby arugula) atop the hummus dip. Then, add the fresh veggies, olives, and sundried tomatoes. Sprinkle feta cheese and toasted pine nuts, if using. Step 3 Serve with warm pita bread slices and extra veggies for dipping, if desired. 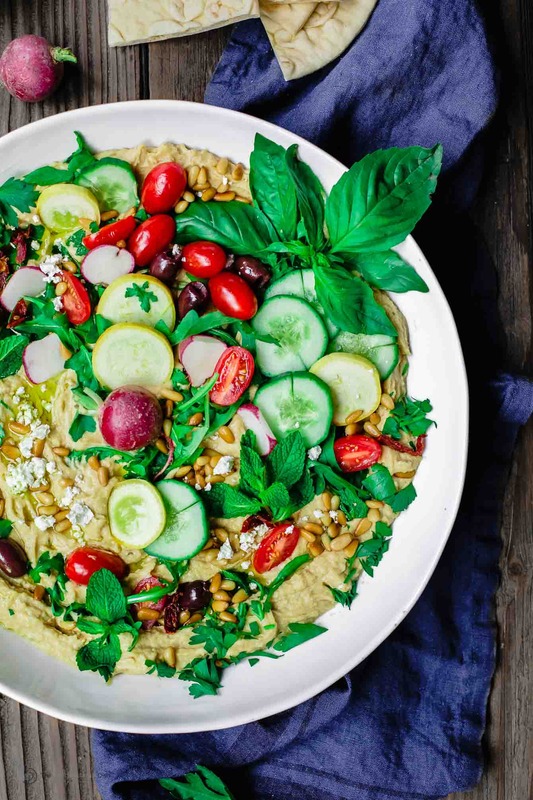 A healthy, satisfying, BIG hummus dip, embellished Mediterranean-style! Loaded with fresh herbs and greens, farmer’s market veggies, and Mediterranean favorites like feta cheese, olives and sun-dried tomatoes.